Today we kick off the idea generator for guy Cards. I'm a huge fan of the Dad's to me and my husband. We were both really lucky to have landed such great parents. They are both inspiring and have supported us. They have taught us great work ethic, family values and, let's face it, most of all how to have fun! I am also, so fortunate and blessed to have married such an awesome guy that is already becoming the best dad to our 2 mischievous munchkins. Before we get started into the projects, I just want to say one more round of thank yous to all who applied for the design team. I was taken back by the excitement and quality of all of the applicants. If you weren't selected this round do not be afraid to try again, you are all really good and deserve to be on the team. To Begin the 'Dearest Daddio' posts we are going to let 2 of the newest members lead the way. I am so excited to be sharing my first project for Emerald Creek! I had a lot of fun playing with my new supplies and getting messy while creating this masculine tag. I hope you are able to check out my process video. I am thrilled to be here sharing my first project with you as part of the design team here at Emerald Creek Dares! I made this little Sing keepsake book for my Dad to gift to him for Father's Day, he has a wonderful voice and has sung in many choirs over the years so this was a perfect project to make for him. 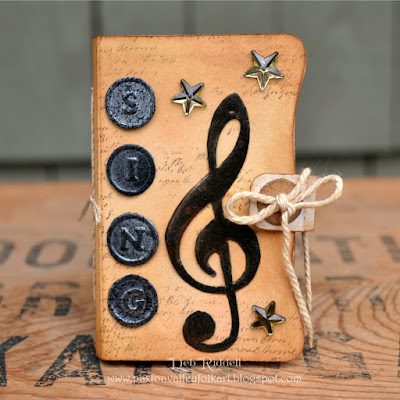 I have some in process pictures on my blog so hope you will stop on by to see how I used my new Emerald Creek Embossing powders, stamps and brads! Fathers Day is right around the corner...so it is time to celebrate the dads in our lives! Time to celebrate the guys in your life! I'm celebrating my Dad and have this metal card ready for Father's Day. And since he isn't super tech savvy I'm hoping he doesn't get a sneak peek! 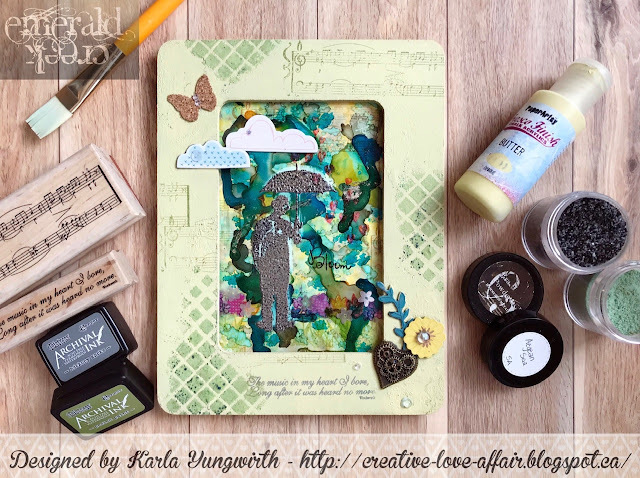 :) Perfect theme for some of my Emerald Creek Embossing Powders and some new Tim Holtz thinlits. Check it out HERE. 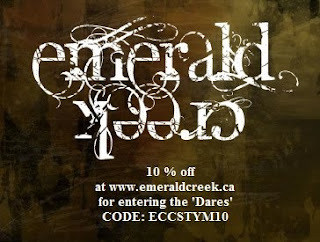 Yogi please email Kim at info@emeraldcreek.ca for your prize code. Congrats Yogi for winning the challenge also a big congratulations to the other top 3! All of your projects were fantastic! Once again design team you have done a fantastic job! Thanks Katelyn! Awesome project for CSM today. Love ya back. Can't wait to see yours for the next challenge. Fabulous guy inspiration from the Design Team, and welcome Heather and Deb! Congratulations to Yogi--what a pretty, beachy card--love those colors! Also congrats to Kerstin and Maryvonne! I'm so honored to have my wedding card listed as a Top Blogger beside their beautiful makes! Hope I can squeak in a guy make for the June challenge! Hugs! Thank you so much Sara! Congrats on being a Top Blogger! Kerstin your piece was amazing. I'm seriously drumming up ideas about it and will contact you soon about an idea! Hugs and thanks for supporting us. Cathy, you are so awesome. Loved the social media pic. Totally forgot about that again. Hugs! WOW! Gorgeous creations and such amazing inspiration - so out of the box! Love everything! Have a great weekend. I am so excited to be a part of the team, thank you for the opportunity Kim! What wonderful projects from the rest of the team and Yogi! Congrats to the Too Bloggers as well, such amazing talent all around! Congrats to the newest DT members! Awesome sauce designs and so much to ogle! Congrats to the winner and top 3! Whoot Whoot!! !